Measles virus does not just cause a rash – it can kill, up to 100,000 people each year. And there are many related viruses circulating in other animals that are not far from being able to infect human cells. Other morbilliviruses include canine distemper virus, which can cause outbreaks in lions, tigers, and primates; phocine distemper virus and cetacean morbillivirus of seals, dolphins, porpoises, and whales, and peste des petits ruminants virus (PPRV). The latter is a threat to small ruminants and is spreading globally. Rinderpest virus of cattle was recently eradicated, and now that immunization against this virus has stopped, there are concerns that these animals will be susceptible to infection with PPRV or canine distemper virus. How likely is PPRV to infect humans? Morbilliviruses are not only genetically very similar, but require the same entry receptors: SLAMF-1 in immune cells of the respiratory tract, and nectin-4 on epithelial cells. 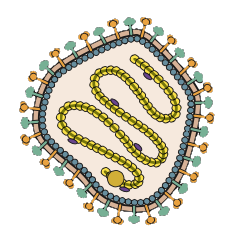 Morbilliviruses attach to cell receptors and fuse with the cell membrane in a process mediated by the viral H and F glycoproteins (illustrated). To understand the zoonotic potential of PPRV, cells were made that synthesize only the viral H and F proteins on the plasma membrane. These HF-producing cells can fuse with cells that produce the sheep SLAMF-1 receptor, but not with cells producing human SLAMF-1. However changing a single amino acid in PPRV H to the residue found in measles virus H allowed fusion with cells producing human SLAMF-1. This amino acid change had no effect on fusion of cells producing PPRV HF with cells producing sheep SLAMF-1. However, the amino acid change did impact the ability of human sera to neutralize infectivity of PPRV. These sera presumably contain antibodies to measles virus, induced by vaccination or infection, which cross-react with PPRV proteins. Virus entry into cells is, of course, not the entire replication cycle. A PPRV mini genome, consisting of a small RNA encoding only viral proteins needed for replication, was found replicate in human cells. Whether the entire viral reproduction cycle of PPRV, with the single amino acid change in H, could take place in human cells is not known. Such a virus would not necessarily cause disease in humans, as there are other barriers to overcome, such as the innate immune response. Nonetheless, if a single amino acid can allow entry of PPRV into human cells, we should be conducting surveillance of circulating viruses for such changes. It it known if the other Morbilliviruses can produce immune amnesia in their host species, as measles virus does in humans? Peter Foster – while I am not aware of studies directly addressing long-term immune amnesia in these other viruses, the biology and pathogenesis of other animal morbilliviruses, particularly through binding of SLAM would suggest similar outcomes as measles in humans with regard to a potential immune amnesia. Would be of interest to find solid evidence for this.